In LGOC days, it competed with independents as much in the rural areas around London as in Central London. Two of the main contenders were, in the South, East Surrey, based in Reigate, and, in the North, the National Omnibus and Transport Co. Ltd, based in Watford. Slowly, they integrated their services and were eventually bought by LGOC, nevertheless still ploughing their own furrows, even to the extent of choosing their own vehicles. Both organisations suffered from routes with low bridges and bought lowbridge buses. National solved their problem with six AEC Regent I’s, with Short Bros. lowbridge bodies for the Watford-Chesham service (later route 336). Unusually, the 24 upstairs seats were 3-in-a-row bench ones, accessed by a sunken gangway each side. 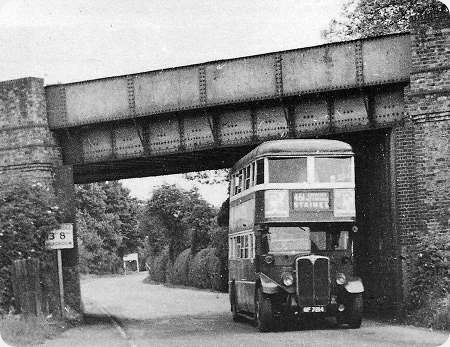 They all went into service in May/June 1930 and lived a steady life until 1941, when the double-decking of the single-deck route 127 (Morden-South Wimbledon) caused some to be painted red and despatched to Merton Garage until mid-1943. Others went to Godstone Garage, Surrey, to assist in route 410 and Weybridge Garage, also with a low bridge problems. Not only did they wander about, but they were also ‘Londonised’ during overhauls, but each one was done in different ways until not one looked like any of the others! They outlived all the other ST’s and were even re-engined with diesel engines around 1949-50 from scrapped STL’s, to extend their lives, until the eventual advent of RLH’s, which sealed their fate. All were withdrawn in October 1952,, with some being sold on for further use. The last one (ST140) seems to have been finally withdrawn as a bus in August 1954, having served a very creditable 24 years service, for a wooden-framed body. Even then, it was spotted cut down as a lorry, in June 1955! The first photograph is almost certainly taken along the A320 near Staines, looking South with the bus heading North. The offending bridge is still there, and regularly struck by buses on charter and heading for Thorpe Park. The surrounding scene, unsurprisingly, has changed beyond all recognition. Always fascinating to see photos—and especially interior shots—of these twin-side-gangway deckers. Fine dignified design. I have heard about twin gangway lowbridge buses, but only ever had the doubtful pleasure of travelling on the single offside gangway type – mainly Hants & Dorset and Southern Vectis, but a couple of journeys on Seaview’s Titans. How was the nearside gangway reached once one got to the top of the stairs? I remember the low bridge vehicles of Newcastle Corporation and United ‘among others’ they were a standard low bridge layout with four seats across, and a single sunken gangway down the off side which ran from the top stair, and had a step up over the drivers cab. Never having seen one of these before, how on earth did you get to the nearside gangway? If I understand the drawings correctly there was a lower height gangway running transversely between the rearmost seat and the nearside gangway. Incidentally National were not owned by General but had an area agreement with them. When the railways bought in to National, geographic names got added, Eastern, Southern and Western, but not Midland. Further to Stephen’s comment on the area National names, I believe both Midland and Northern National were registered, to protect the names from use by others. However Northern was never used, there being no obvious company in the National empire, and Midland was not used, as it became an operating area of Eastern National, almost entirely separate from the main Essex Eastern National area. In 1952 it was transferred to United Counties, increasing that company’s size. Eastern National then regained size by the transfer of Westcliff on Sea Motor Services, and the take over of Hicks Bros and others in Essex at around that time. (Moores of Kelvedon survived for another 10 years or so). Thanks Stephen, now we know how, the next question is, why? I suppose it made sense to someone, but I don’t understand the logic in having an extra gangway which reduces seating capacity, and would presumably be more expensive to build. The conventional lowbridge layout must have been extremely inconvenient at busy times. If the person furthest from the gangway wished to alight, the other three passengers on that seat would have to unload themselves into the gangway and move forwards to let them out. If similar things were happening on the seats in front, the result could be the passenger equivalent of gridlock! Providing an extra gangway would completely eliminate this problem. I guess the objective was to speed up boarding and alighting times, and perhaps make fare collection easier as well. Certainly being a conductor on an offside gangway lowbridge bus must have been a challenge. I recall travelling on Hants & Dorset lowbridge Bristol Ks between Poole and Bournemouth on occasion. They had the gangway on the nearside upstairs IIRC, and it certainly was chaotic if the bus was busy. It must surely have led to delays, and issuing tickets to the passenger/s furthest from the gangway must have required some dexterity and conductors with very long arms! Did Leyland have some kind of patent on the single gangway design, or am I deluded? In more prim & proper days it may have been felt undesirable with single gangways for gentlemen to be clambering over ladies’ knees to leave their seats? Still is, really. These designs always seemed a necessary evil, as big operators seemed to dispose of these types when bridges permitted- and hence the appeal of the Lodekka, although this presumably also gave an opportunity for standardisation in a limited market. Unless I am mistaken, the bus in the top picture by V.C. Jones on the 461 route bears the registration GF 7214; this identifies the bus as ST 140. In the late 40’s/early 50’s, Harrow Weald (HD) garage was host to ST 136, ST 141, ST 162 and ST 1090. At various times I rode on all 4 of these fascinating vehicles on Route 230, which had two low bridges, one of which was in Headstone Drive, Wealdstone close to the now defunct Kodak factory. As a youngster, I remember low bridge buses with an off side gangway, but instead of one seat going four across, they were staggered two by two, with the nearside pair being slightly further forward, but I cant for the life of me remember where I saw them. Newcastle had All Leyland PD2’s and Park Royal Regent V’s, and United had ECW Bristol KW’s, but I don’t think it was either of them. Moor Dale had a couple of Ex Ribble PD2 White Ladies? or it may have been whilst I was on holiday with relations who lived in Kilmarnock ‘Western territory’. I seem to recall seeing photos of piano-fronted buses with about a 3/5ths wide central roof-bulge down the whole length, front to back. If this isn’t one of my wildest imaginings, was this the earliest variant of a lowbridge bus? I don’t think that they had anything to do with the Beverly Bar. Chris, what you describe would seem to have been early AEC Regents with the "camel roof" body design. This was a normal highbridge body that had the roof level lowered except for the central section over the gangway. I imagine that one had to be careful not to bang one’s head when leaving one’s seat. The reason for this rather futile idea was to give the visual impression of a low roof line to compete with the Leyland Titan lowbridge design. It was soon abandoned. Chris, perhaps they were ‘tunnel’ buses. LTPB had some for the Blackwall tunnel. Did Buses as well as trams use the Embankment to Kingsway tunnel? Ronnie, in 1952 West Yorkshire experimented with staggered upstairs seating on a 1951 lowbridge Bristol KSW6B (830, later renumbered DBW12: KWU368). 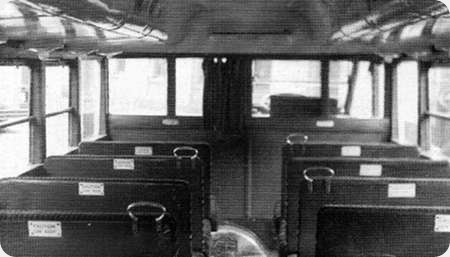 The original rows of bench seats for four were replaced by staggered rows, each offering their four occupants their own individual seat, each seat being staggered back from the one to the left of it. 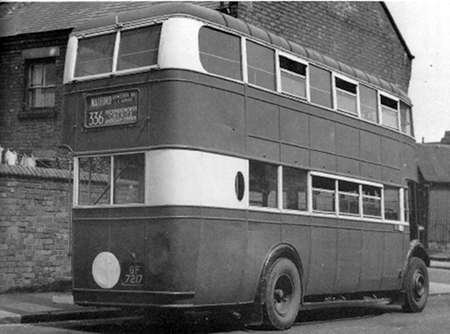 The bus was loaned to United Auto in December 1952 for evaluation, so could this have been the one you rode on Ronnie? (If this is the case, I’m sorry if I’ve given you’re age away!). West Yorkshire’s 1953 delivery of KSWs, to be their last, were delivered with staggered seating upstairs, these being KSW6Bs 853/854 (later renumbered DBW33/34: LWR419/420) and KSW6Gs 855-864 (later renumbered DGW1-10: LWR421-430). I still have vivid memories of riding upstairs perched on the gangway end seat of WY’s earlier lowbridge KSWs, as they swung around the sharp lefthand turn from Otley Road into Market Street, Shipley, on their way to the bus station. Not an easy task when you have only your left buttock on the seat, whilst the right one hangs in mid-air, attempting to defy gravity with only its attached skinny schoolboy leg to offer support. I’d put up with this all again however, just to ride on such a wonderful beast. No, John L, although an experimental trolleybus was built and run through a few times. It had a normal nearside open platform, with an offide entry/exit, too, with sliding doors, necessary because the subway ‘stations’ had island platforms. The trolleybus roof was too high for it to use its poles, so would have had to stow these, gone through on battey power, then put the poles back up! I also read once that turning circles inside were tighter than with trams. When the tramway system closed in 1952, the subway closed with it. Roger C – You’ve hit the nail on the head, (the clever metaphor won’t escape you!). I’d forgotten that Leyland did Lowbridge and Hybridge bodies which took added advantage of the low TD1 chassis. AEC’s futile camel-roof design was probably one reason for poaching Rackham from Leyland! David W – The ‘Blackwall Tunnel’ buses were built much later than the ones I had in mind. They had conventional roofs, which were slightly more rounded. One feature they had was tyres with reinforced walls to extend life, since they rubbed along the kerbs of the two tunnels. Perhaps they even swopped the tyres offside/nearside periodically to further extend life. John H – Route 230, along with the 127 Morden-South Wimbledon, were the only two lowbridge routes in LT’s ‘red’ Central Area. The 230 was usually served by the unique ‘unfrozen’ lowbridge STL’s of 1942, whereas it was usually the green Country Area buses from Reigate which covered the 127 until 6 (later another 6)’austerity’ Daimler ‘D’s’ appeared in 1944. I recall travelling on Uniteds route from Newcastle via Bedlington to Ashington in Northumberland in 1963 I knew of United having 2 ECW Bristol’s KW’s In its fleet. Seating being 4 across always seemed to cause problems when full to capacity. Ronnie, re your comment 31.07.2015 my apologies for this delayed reply but I am a newcomer to this group. North Western RCC had such a layout on a batch of 10 PD2/21s with Weymann bodied Orions KDB 671-670. There was quite a bit of publicity in the Stockport newspapers at the time about the technological "advances" with these staggered seats and the next time I was in Mersey Square I went inside one to have a look. Frankly, I couldn’t see what the fuss was about. According to Glory Days these buses were not liked by the crews.